Stepney used to be known as Stebenheath or Stebenhythe. Hythe is an early word for a landing place for boats, so the name may mean ‘St Steven’s wharf’. 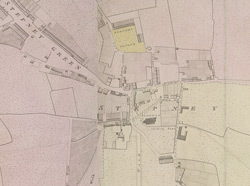 The parish once included all the land east of the city to the River Lea and north of the Thames to Hackney. In 1086, the famous Domesday survey of England recorded a population of only 900 living among its meadows, marshes and woodlands. As the area became more populated in late medieval times, it was broken up into new parishes and Stepney shrank to the community living around the Church of St Dunstan. During the 18th century, elegant Georgian houses graced Stepney Green, by then as fashionable a place to live as Hackney. However, the 19th century brought a tide of cheap speculative building, both domestic and industrial, and Stepney’s air of gentility was swept away as wealthy homeowners moved to the smart new streets being built to the west of London.